Furnaces are under a ton of stress and pressure at almost all times, which is why they require frequent maintenance and repairs in order to stay in great condition. Keeping your furnace running well and efficiently requires that you give it a great deal of attention, which is why the professionals at Ball Heating & Air Conditioning recommend that you have your furnace tuned up at least once every year. As long as it gets the maintenance that it needs, your Wichita home's furnace could have a lifespan as long as 16-20 years. However, no matter how well maintained your furnace is, it will eventually need to be replaced, whether it completely breaks down or it develops too many problems for it to be reasonable to keep it going. If a furnace doesn't get the attention it needs, it may last for only around ten years. When you need to have your furnace replaced, you can depend on our professional heating and air conditioning contractors to tackle the job. No matter what type or brand of furnace you have, our professionals will be able to take care of every part of your replacement. We'll make sure that you receive the highest quality workmanship possible, as well as the best possible customer service. And we always guarantee your complete satisfaction with our work. Our technicians are all licensed, trained, and experienced professionals, so you're always guaranteed to be working with an expert that you can trust. From maintenance and repairs to replacements and installations, we can handle any work that your furnace might need. Once your furnace has been being used for about ten years, you should begin playing close attention to its behavior and its condition. After ten years of use, furnaces often start to develop serious problems, and they may break down unexpectedly at any time. Continuing to use your furnace when it has any kind of problems will have a huge effect on your Wichita home's energy efficiency. Any small issues with your furnace will also cause more problems in the future, so any repairs you need should be taken care of as soon as possible once they develop. Our professional heating contractors provide inspections for furnaces, and we can let you know if repairs will be able to solve your problems or if a replacement is necessary. If you do need to have a replacement, we'll be able to handle every aspect of the job. None of these signs means that you necessarily need a replacement, but they can often signify serious problems. If you notice these problems, call our professionals immediately, and we'll help you determine the cause. 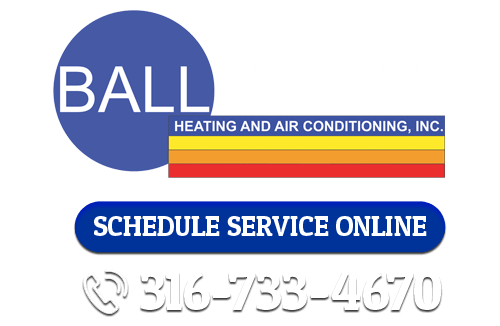 If you're looking for furnace replacements in Wichita, call Ball Heating & Air Conditioning at 316-733-4670, or fill out our online request form.